I was in Alabang Town Center late afternoon and watched Transformers. I was overwhelmed with the large viewer turnout and the long line of people to the cinemas. We got the 4:55 P.M. schedule coz there are earlier times that are already sold out. Four cinemas of Alabang Town Center are showing Transformers and one cinema is showing Fantastic 4. After buying tickets, we strolled first the mall. Dropped by PowerBooks then went back to the line of the cinema. We have bought popcorn and hotdog sandwiches for our snacks. The movie is really impressive. I actually can’t remember the whereabouts of Transformers cartoons way back grade school. What I can remember is that I have seen it before. Anyway, the movie is really great. You won’t get lost of the story while watching it. The effects are superb! The robots seem so real and alive. Its way way impressive from the movies I’ve seen this year. The robots are even funny and humorous, can you imagine that. 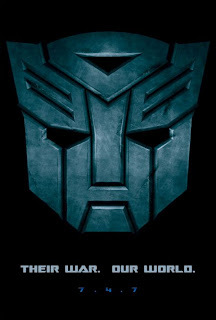 I’m looking for Part 2 of Transformers!